Today’s guest post is by James Scherer from Wishpond. The Wishpond writing style is full of examples and how-to’s…I like that. Enjoy! 1. My two-year old got on my computer and typed a bunch of stuff in that I have had to extract. 2. I added my own take..some takes are funny. In others I think I am funny, but you likely don’t agree. But I tried. Also, props to the Inbound Marketing Agents and Kapost blogs where I borrowed most of these stats. Lets move on to the stats after this really cool picture of numbers. 25 days later, customer says to team members: “Ok, how do we do it”? 1. The Keys to Content Marketing Success Summit — August 14, 9-1pm. Join us to hear Ardath Albee, Justin Gray, Toby Murdock, and Tony Zambito give specific, actionable advice on how to design, build, and operate a content marketing organization. Content marketing is the movement dujour across b2b and b2c which is why we have decided to create a content marketing virtual summit on August 14 from 9-1pm PDT that I know will be awesome — Content Marketing Summit. Paul (our editor) has put together an amazing event with expert speakers like Ardath Albee, Tony Zambito, Justin Gray, and Toby Murdock. The topics will start from the creation of buyer personas to-translating buyer personas to action-to-creating a content marketing organization-to-distribution. I hope you join. This is important: We have called out content marketing as its own movement, but in reality content marketing is part of everything you do in sales and marketing lifecycle. It is an approach — You are creating content that the buyer actually wants to consume. It’s that simple. The content you create should be designed to have a direct impact on your core revenue driving activities such as inbound marketing, demand generation, lead nurturing, social marketing, selling and closing. To me, content marketing ROI should be tracked against the metrics you track in your overall revenue machine. When done correctly, content marketing should drive the metrics you are already tracking such as visits, leads, and revenue. If you are viewing content marketing as it’s own “thing”, then you are back in “arts and crafts” class and creating content for the sake of creating content. I love Neil Patel – both Quicksprout and the Kissmetrics blogs. Great content, always actionable and specific or with real data. He recently posted a great infographic on optimizing contact forms. I enjoyed it…I think you will too. Enjoy. This post stars Jason Miller and his company Marketo. (no relation to Jon). 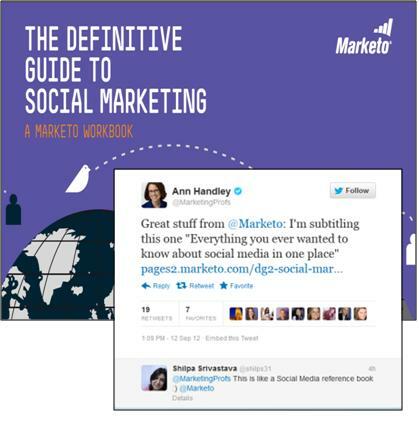 The story is about their social campaign for the Definitive Guide to Social Marketing. There are some great ideas and take-aways as we continue to try to answer the question: “Does social marketing work”? 1. Visual, Visual, Visual — to be successful in Facebook you have to have great visuals. Think about it, Facebook is a massive image sharing feed (pls see Instagram purchase), so you have to consider how your visual will compete. 2. Be fun — Facebook is a place for fun. People go to Facebook to break away from their day-to-day and have fun. 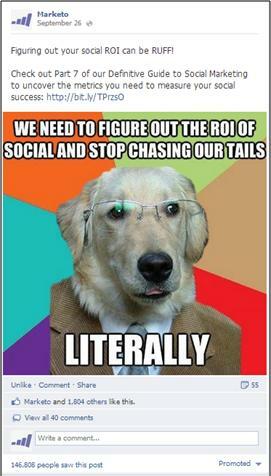 Your promotions need to compete with the funny anecdotes and personal stories in everyone’s feed. 3. Juice the amplification with promoted post — Remember the key is to be in the feed. Promoted posts are a small amount of money to help you achieve that goal. 3. 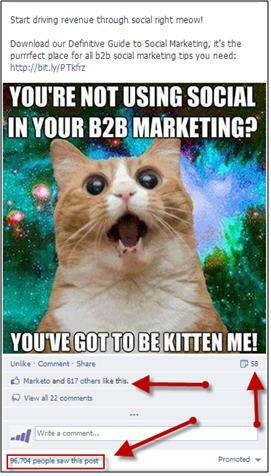 Your buyers are on Facebook, you just have to approach them correctly — Here is the prevailing irony in b2b Facebook marketing: “My buyers aren’t on Facebook” is a common b2b refrain yet there are a billion active users on Facebook. In other words, the odds tell you that you are wrong…they are on Facebook. See some of their ads below. *Prospect for Marketo is defined as “right person/company”, engaged with Marketo, and fits target profile. 2. Advocates and employees — I think a lot of marketers are getting good at using their army of employees but many marketers are still getting around to building their army of advocates (influencers, customers, etc). 3. Take a value based, serious tone on Twitter — You can see the copy below. The copy here is more classic copy. 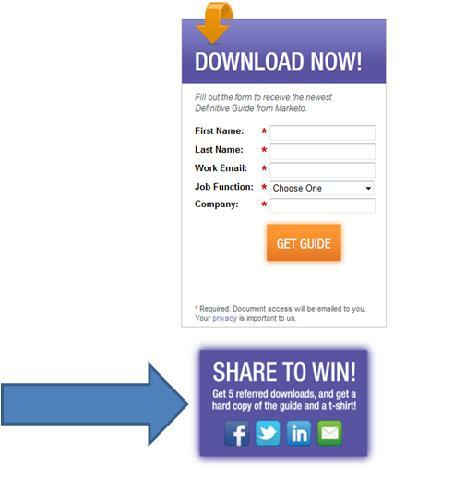 Marketo ran a “Share to Win” contest. 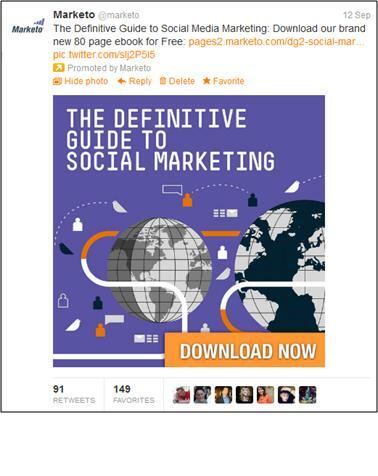 For every 5 referred downloads, brand influencers earned a printed copy of the Definitive Guide and t-shirt. 1. Each social channel is unique — Similar to your more traditional multi-channel campaigns, make sure you understand what the community in each channel will respond to and test it. The Facebook approach versus Twitter approach seen above is a great example. Ok, it this video does include me along with some awesome takes from other thought leaders. Note to self: I misunderstood the question and thought we were only talking about video. I still made the cut so there you go. PS my hair looks terrible. PPS Thanks Marketo and Jason Miller for including me. Background: Shoedazzle is a smoking hot internet site. Basically, you pay a monthly fee and you get to pick between a variety of shoes and now accessories allegedly curated by Kim Kardashian and other stars. In August they hit 13 million members. I told my wife about it and she asked to check it out. B2b marketers should try to stay on top of b2c marketing and advertising techniques and get ahead not behind. Let me walk you through my user experience than provide some commentary. 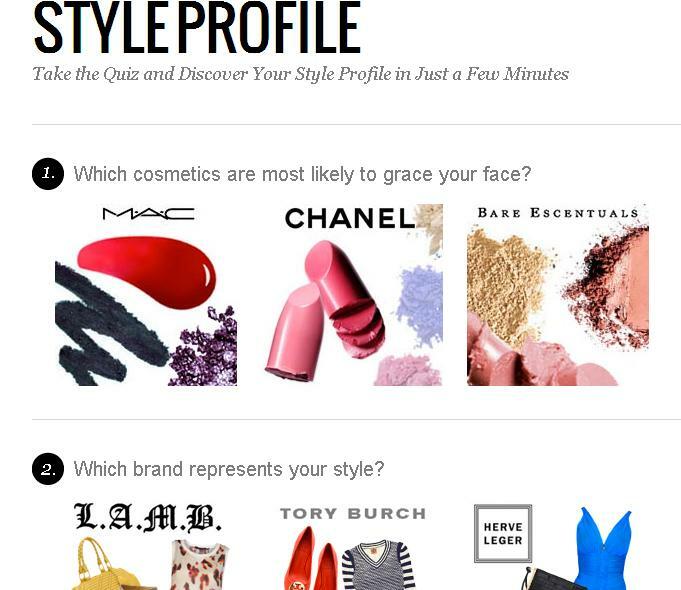 The personal style profile “quiz” is not an ugly series of drop downs, but instead a set of multiple choice graphics which you click to represent your likes/dislikes. It’s more fun, visually appealling, and made my wife really believe they could figure out what to send to her. PS I still have not given up any information to shoedazzle yet. Check out the easy registration. In b2c, it’s all about getting your email address. Guess what? In b2b: It’s all about getting your email address. So why make it hard to get? If it’s the top of the funnel and the beginning of the relationship, then can’t we move from free to email address and THEN to more data? BOOM. I’m in and now have access to shoe choices. When we order one, we are then prompted to add more data to our account. Why did I just show this to you? 1. That was fun — Why the hell do b2b websites think they have to be so boring? We roll around talking about how b2b marketers have to compete for buyers time, isn’t fun and excitement a pretty good emotional trigger to hit? 2. 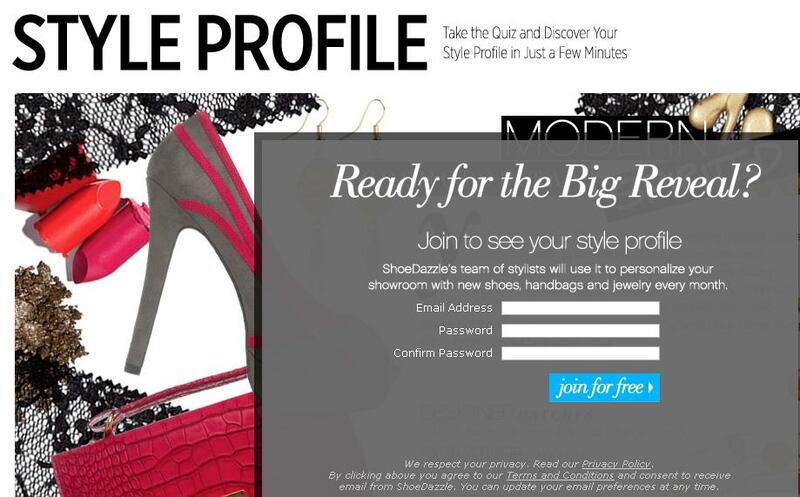 Rethink reg pages and profiling — If you ask me if I advocate moving to Shoedazzle’s model of the graphical profile, I am not sure yet. Truthfully, I went to the site tonight randomly, and I just started re-evaluating. In other words, I am not sure yet…but I do believe in thinking outside the box. I enjoyed helping my wife click the boxes…it was fun which is very unlike b2b where you make me look at any ugly box, type in a bunch of seemingly meaningless data which I make up sometimes, and sometimes make me scroll through a list of 12 roles to choose for myself or sift through and choose from an industry list that I am pretty sure doesn’t have my industry on there. 3. 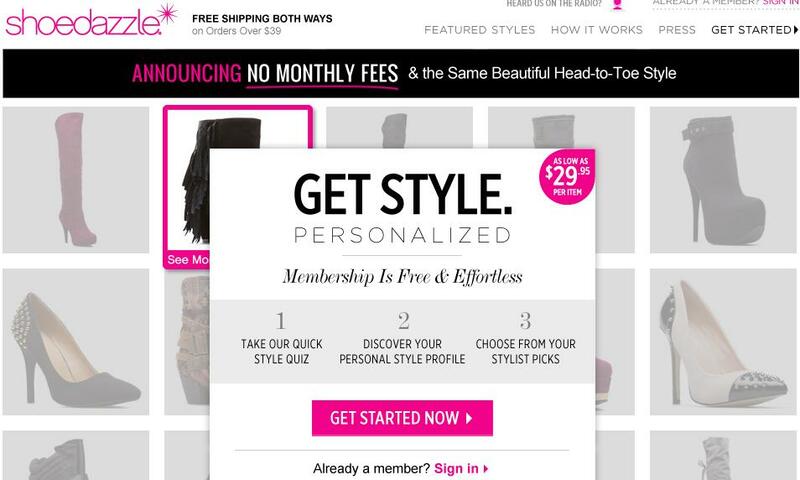 Shoedazzle costs as much if not more than a license of ZenDesk or a GoogleApps license– Have you heard of the consumerization of IT? Then why can’t we talk about the consumerization of IT marketing? 4. Build your list, even if you sacrifice some data initially — go to any progressive b2c website and many hit you with a pop-up box asking just for your email. They want that email and they don’t pussyfoot around. Eventually, we want more data, but right now, can’t we make some sacrifices to start the relationship. I am sure some inbound marketing clone will tell me: “Create great content and they will come back”. Really? Is that why the core features for marketing automation systems is email marketing functionality? According to a preso by email expert, DJ Waldow, popping up a request for email grows list exponentially. Funny or Die moved to a pop-up box and gets thousands of new emails daily. Companies have seen 75-80% growth in email subscriber optin lists as a result of the pop-up box. Check this preso out for more. 5. More on the home page: Remember when you first signed up for Twitter? — Let me help you. Twitter wants you to sign up for their service. There is not much else to do on their home page but register. By the way, three fields total on the reg form. 6. This is for fun, but is there something here? — As I mentioned previously, I don’t know where I am going to take this, but I learned a lot from this experience, and I look to b2c for inspiration not to “poo-poo” it as irrelevant. I think it was three years ago that I moderated a webinar with Michael Brenner where he listed mobile marketing as his big coming trend. I didn’t think anything of it for years. I just got an Iphone and Ipad and now I do everything mobile. I clear my inbox on my phone, I read blog posts on my Ipad. It’s one of those things where I just had to feel it. Now I get it. To you my b2b marketing friends, I give you this advice: Start with the mobile experience first when you build your emails, content, etc. Everyone tells you “be where your buyers are”, well they are on mobile. I recently spoke at a couple webinars listed below where I felt it was important to talk mobile marketing. As a result, I ended up with some good info to pass along. 1. Many mobile email readers are triaging their inbox, deciding whether they want to read your email now, later, or never. It’s all about responsive design. Here is Eric Wittlake on the topics: “Responsive design delivers a page that is appropriately laid out for every browser, based on the individual device, screen size, orientation and more. Google is encouraging responsive design, further solidifying it as a best practice all B2B companies should be considering in their mobile plans.” As I use my smart phone more and more, I have come to learn that my “eject” button is quicker than ever. If you aren’t viewable, I don’t force it — I leave. That means all web pages, landing pages, etc that your buyers will see and touch need to be optimized for viewing or they will be gone too. Okay, back to the ridiculous title. How many times over the last three years have you heard: “Marketers need to act more like publishers”. Many people interpret this mantra to mean creating third-party, objective content and a lot of it. There is another important factor: Publishers create what I call “content reliability” — they constantly deliver content on a consistent basis. Example: A newspaper will feature a columnist X on Tuesdays and Thursdays each week or a simple example, you will get a newspaper on your doorstep that will have a front page, sports page, etc. Remember that. 2. Build the show brand — There is typically a network with a big brand who actually wants for their individual content pieces (their shows) to have their own brands. People know what they are going to get from their favorite shows. Have you ever thought about delivering your content like a network? Create an event brand that you deliver consistently throughout the year. Build star-power that people can’t wait to listen to each week. 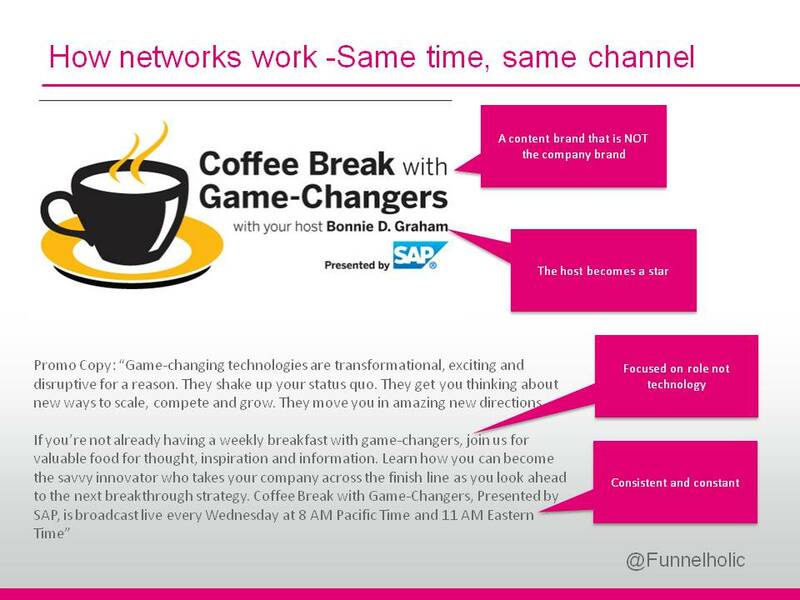 Here is a great example: SAP runs a weekly event called “Coffee Break with Game-Changers“. It’s on every week with it’s on content brand and they have the same dynamic, exciting host Bonnie Graham. While I am pretty sure SAP has a humongous email database, it is NOT used to promote this show. The point: audience started small and has continued to grow organically over time by building a following just like a radio/tv show. Many times with online events, each event is it’s own large-scale campaign instead of thinking of events as a content product you deliver over the course of time. I talk about this use-case and more during my webinar on Thursday. Join me!